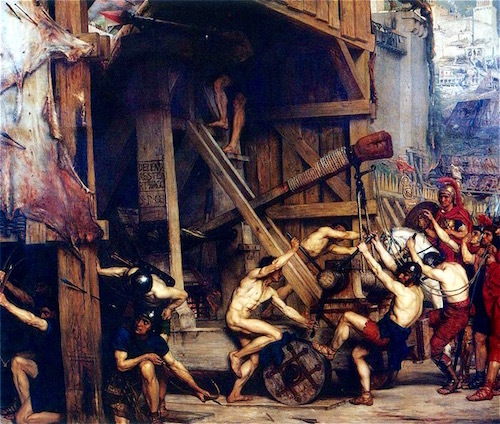 Catapults of various configurations and other engines of war have been used by armies since very ancient times. 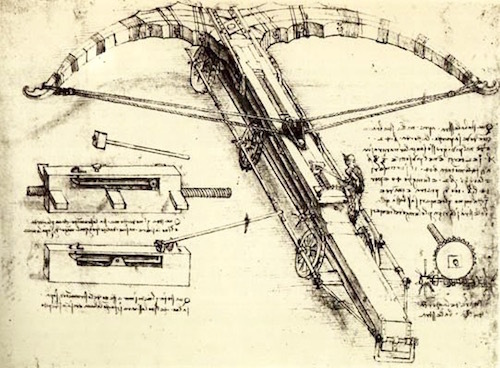 Perhaps the crossbow, invented by the Chinese in c. 700 BC, was the origin of the catapult? 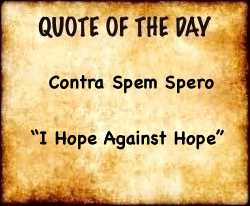 It like the catapult uses a “firing” mechanism by pulling a lever back which fixes the projectile in place on the bowstring. 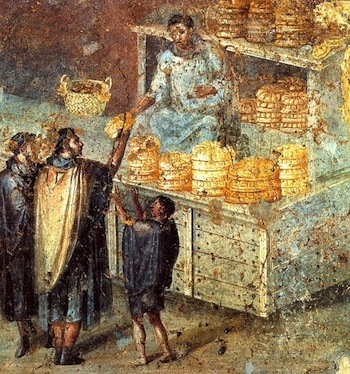 When the lever is released, the arrow is fired. 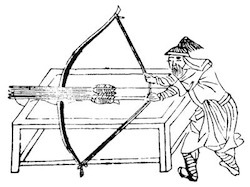 The sketch on the right depicts a Chinese Lian Nu (連弩), multiple shot crossbow without a visible nut or cocking aid. The crossbow attempted to increase the range and power of the very early bow and arrow. 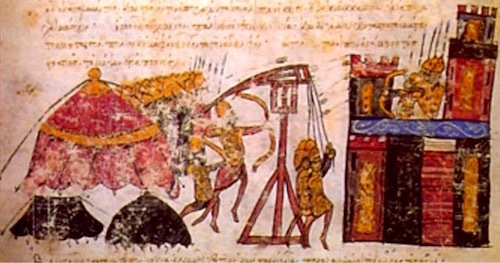 Medieval soldiers winching down the arm of a trebuchet powered by 10-ton counterweights. 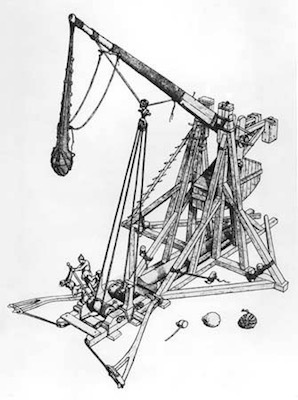 The difference between a catapult and a trebuchet, coming from French trebuchier meaning “to overthrow, topple,” is with the catapult the arm holding the projectile bends as it is pulled down and the spring action as it straightens hurls the projectile. With a trebuchet the stone is at one end of the middle arm and a heavier weight is at the other end. 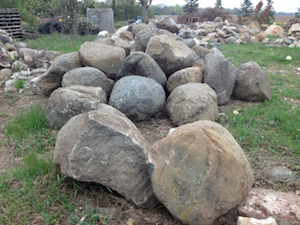 When the spring action, the catch, is released, the heavier weight swings down and the stone is slung forward. 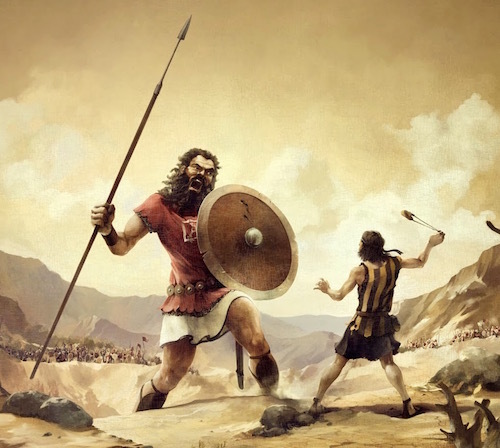 A large trebuchet with 10-ton counterweights could hurl 300-pound wall-smashing boulders as far as 300 yards. 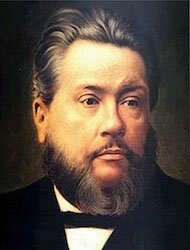 Charles Spurgeon (1834-1892) was an English Baptist preacher/warrior who occasionally catapulted his words into his church and the words often were felt outside his church.